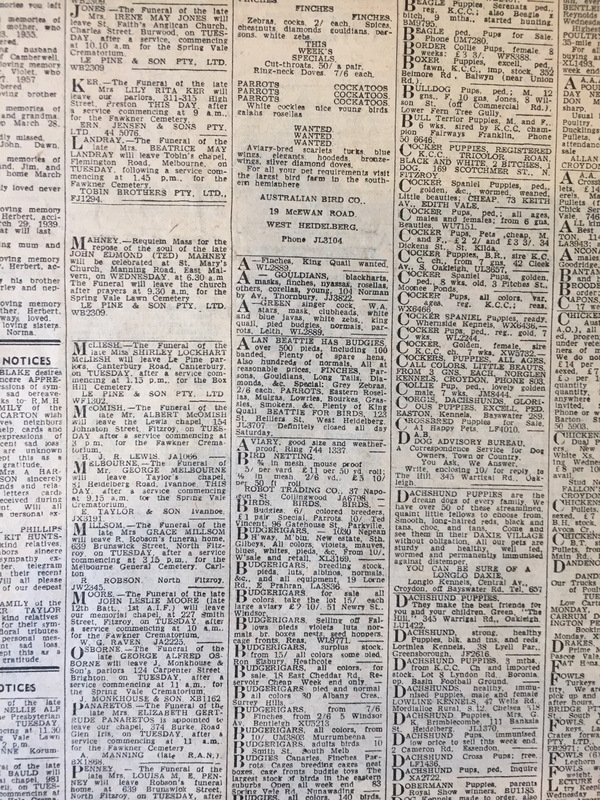 The current practice of many newspapers is to microfilm their pre-digital issues and destroy the original hardcopy, because newspapers in quantity can be very bulky to store. This is fine when the scanning or filming process works as expected, but occasionally there is a glitch in the system, and the process fails. 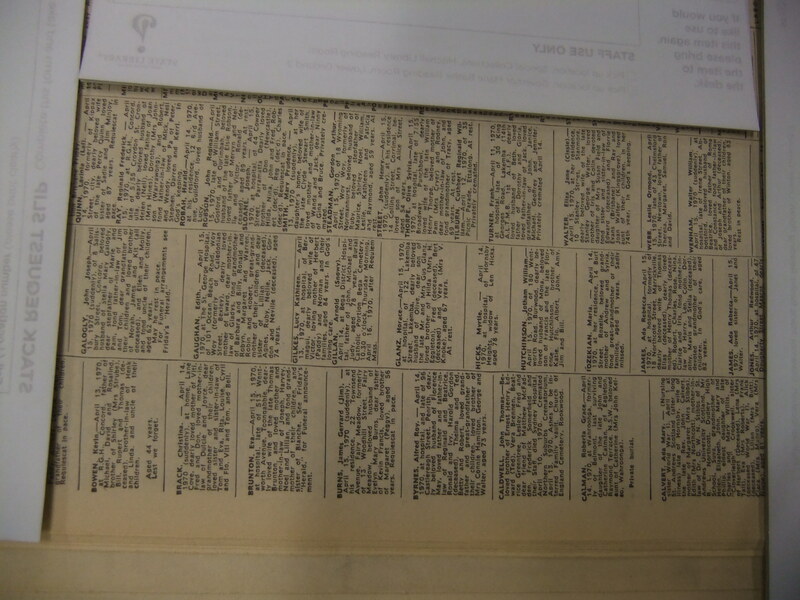 The usual result of such a failure is the omission of a page or pages from the microfilm or scanned record. If the failure is not picked up immediately and corrected, then there is a very high probability that the original will be destroyed with no copy left available for reference. Microfilming is usually carried out once only, and the resulting film made available to all libraries and other institutions who require a copy. 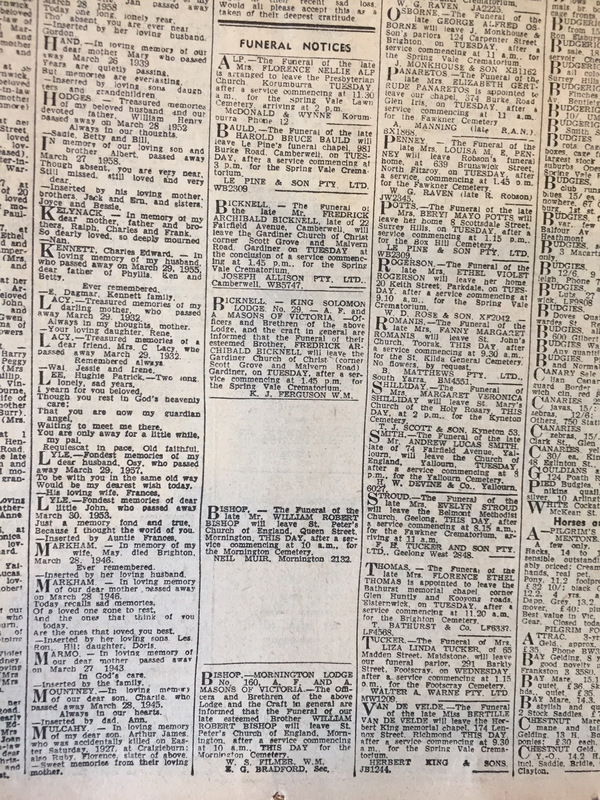 This means that a mistake, once made and left uncorrected, will exist in ALL microfilm copies of the paper. As much of our back-indexing is carried out from filmed or scanned copies, Ryerson is in a position to identify many of these production glitches. 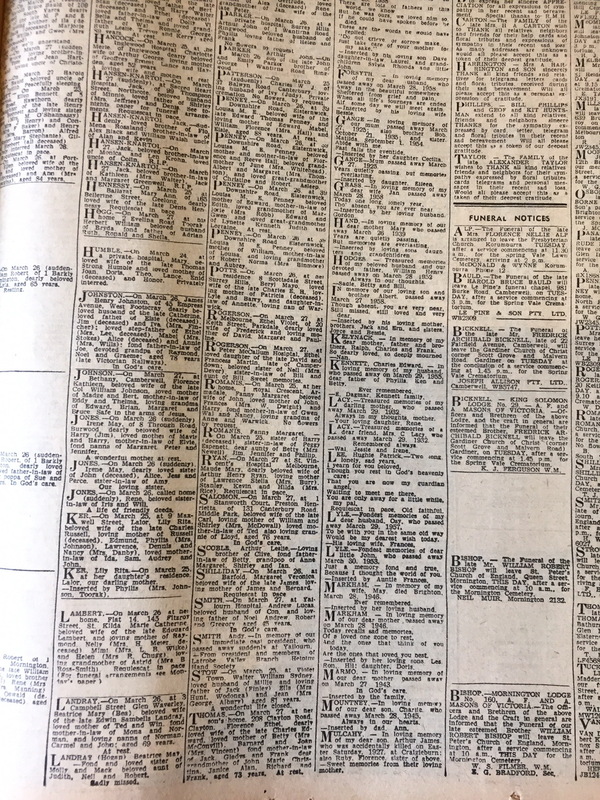 In some cases we are unable to do anything about them, but often we are able to track down a hard-copy version of the incorrectly-filmed paper. On this page, you will find details of such errors we have identified, and copies of the notices that we have been able to find to plug the gaps caused by some of these production glitches. 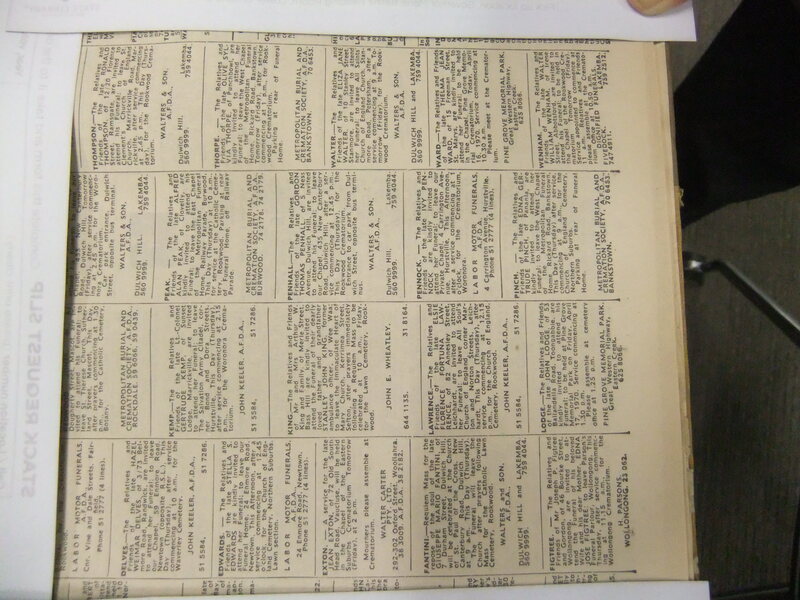 Problem: Only pages 7-12 of this issue have been filmed and digitised - the index, death notices and funeral notices are all missing. SLNSW has advised that their hardcopy is damaged, with many pages missing, hence the problem with the digitising. 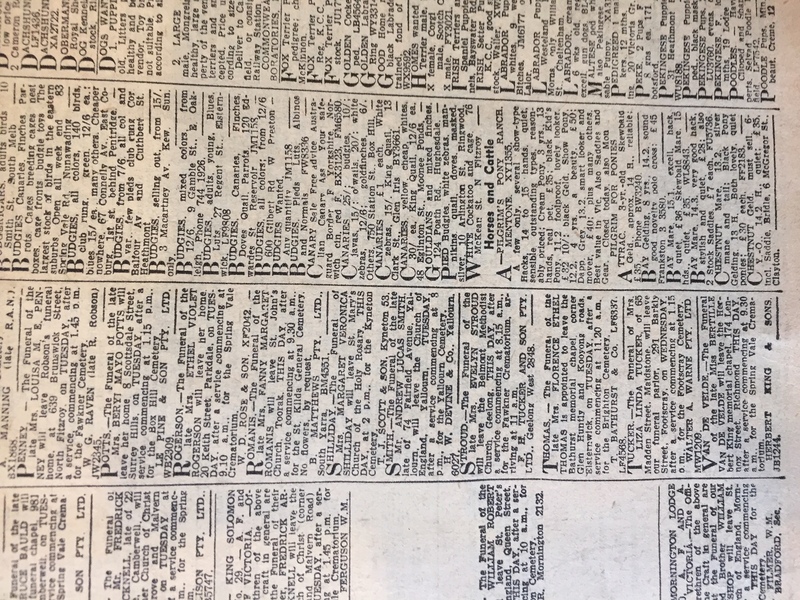 Problem: The entire paper (issue 13,293) is missing from (a) Trove, (b) the SMH microfilms produced by Pascoe, and (c) the SLNSW hardcopy collection. Fortunately SLVic has a hardcopy version. Problem: This edition of the SMH contained 10 pages, with the funeral notices appearing on p10. Unfortunately only pages 1-9 were filmed and digitised. Problem: Page 1 of this edition, containing the deaths, has not been filmed or digitised. 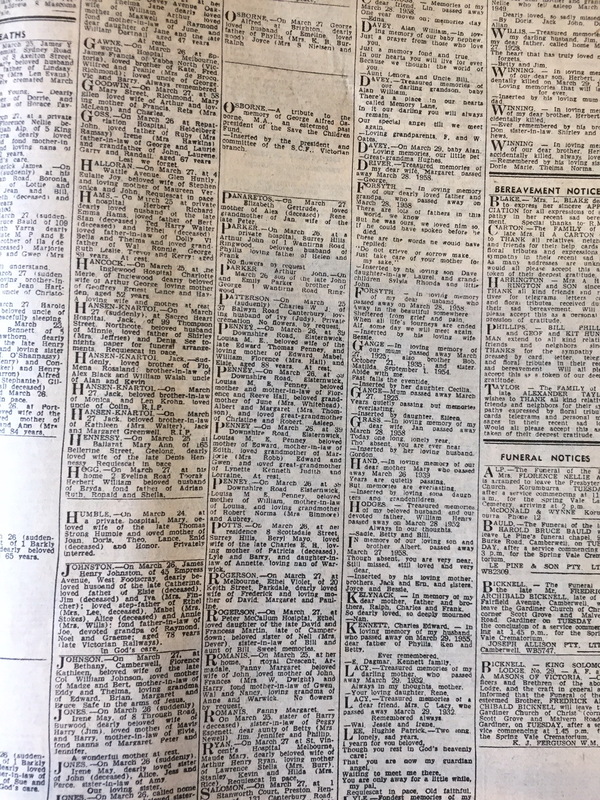 Problem: This edition of the SMH contained 12 pages, with the funeral notices appearing on p12. Unfortunately only pages 1-10 were filmed and digitised. 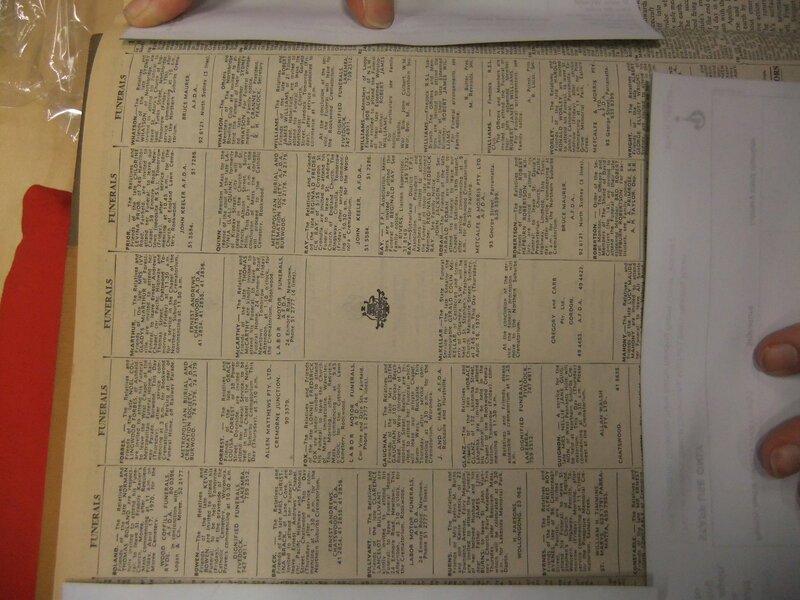 Problem: This edition of the SMH contained 22 pages, with the funeral notices appearing on p22. Unfortunately only pages 1-20 were filmed and digitised. 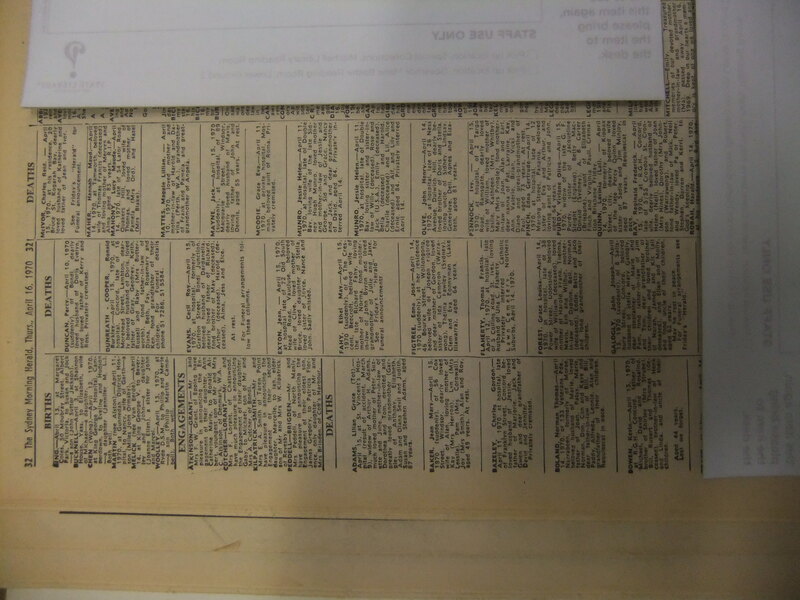 Problem: The Funeral notices were published on p15, but this page (and only this page, out of 32 pages) has not been digitised in Trove. 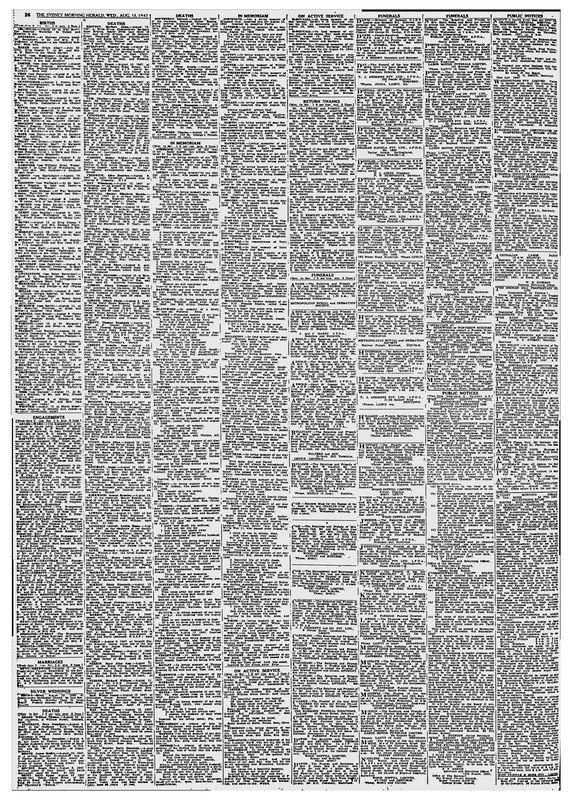 It is, however, present in the microfilm copy of the paper. 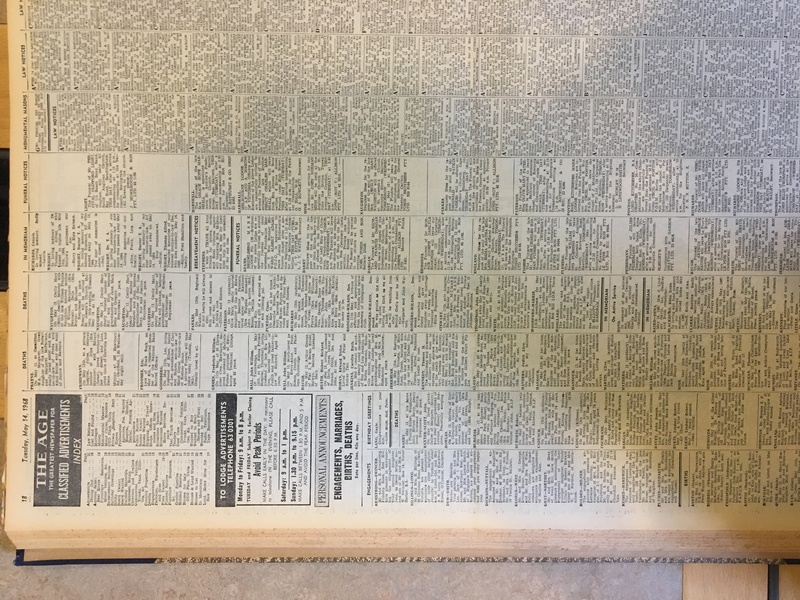 Problem: Some pages in Trove were scanned from a different edition of the paper. 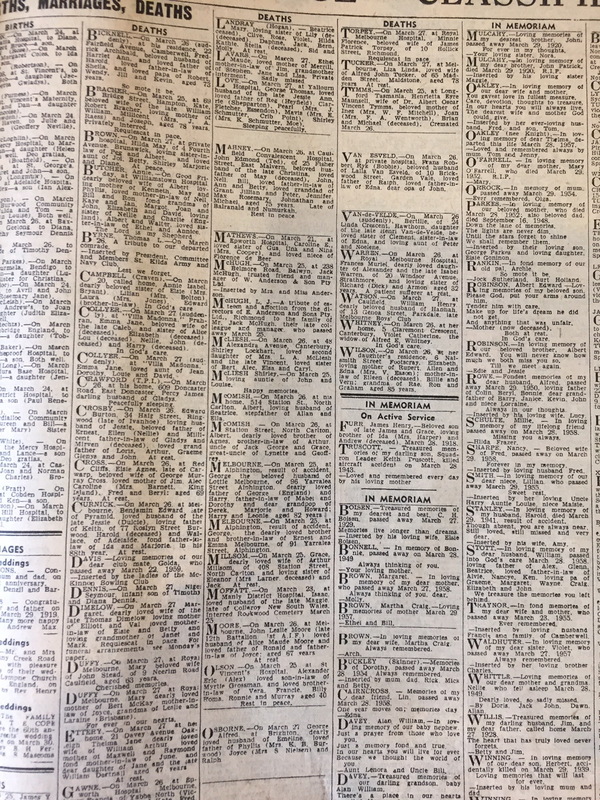 The Classifieds Index on p10 shows the Birth, Death and Marriage notices as being on p26. However, the page following p25 is labelled 26* rather than 26, and does not contain any notices. 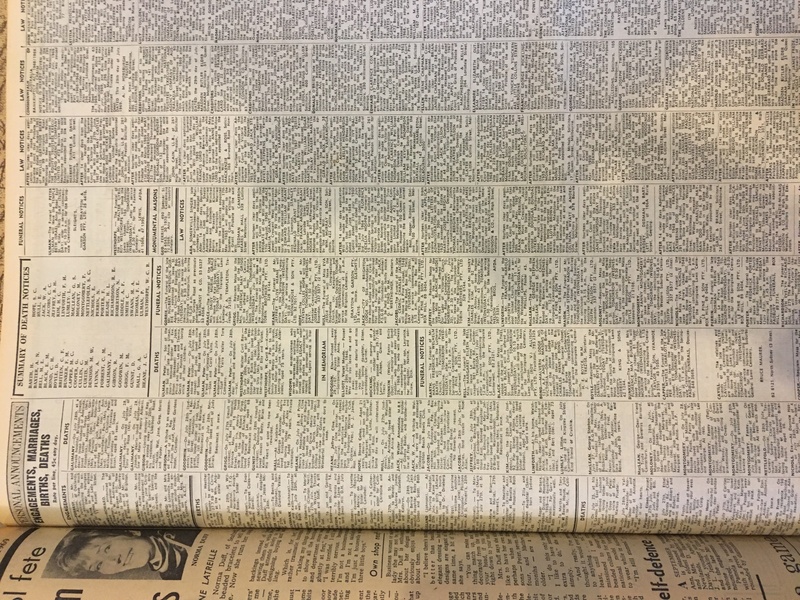 Fortunately Google, which scanned newspapers from the Fairfax archives rather than the microfilm, has scanned p26 from an earlier edition of the paper. 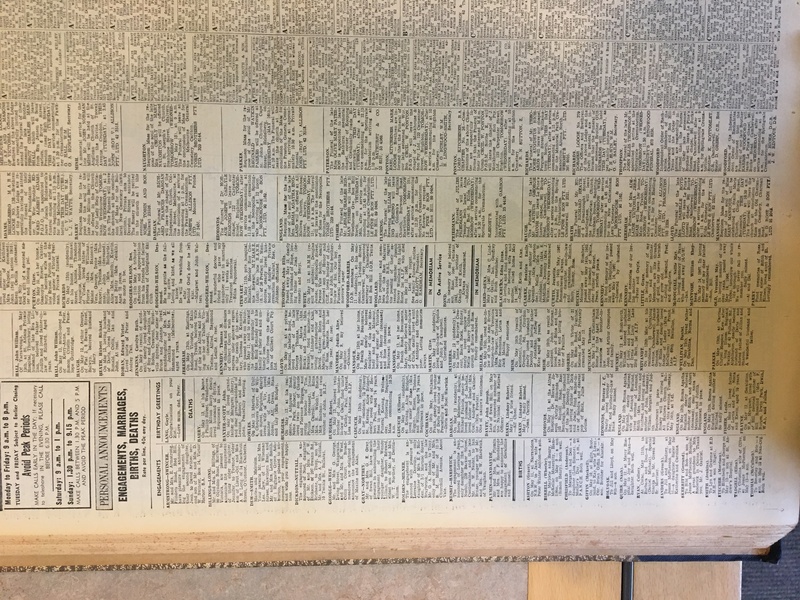 Problem: This issue of The Age has not been digitised - it is missing from Trove. 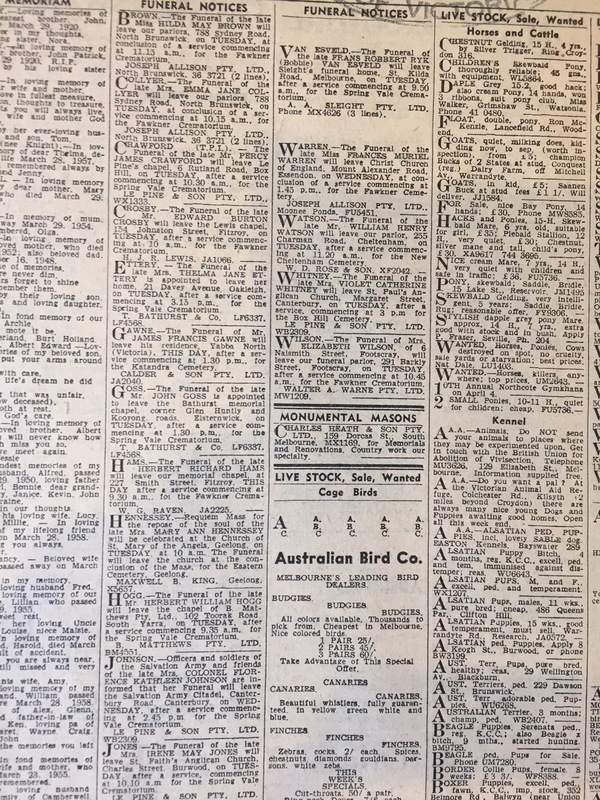 Problem: The issue available on Trove is missing five notices at the bottom of p2 col 1, as the result of the corner of the page being torn off. 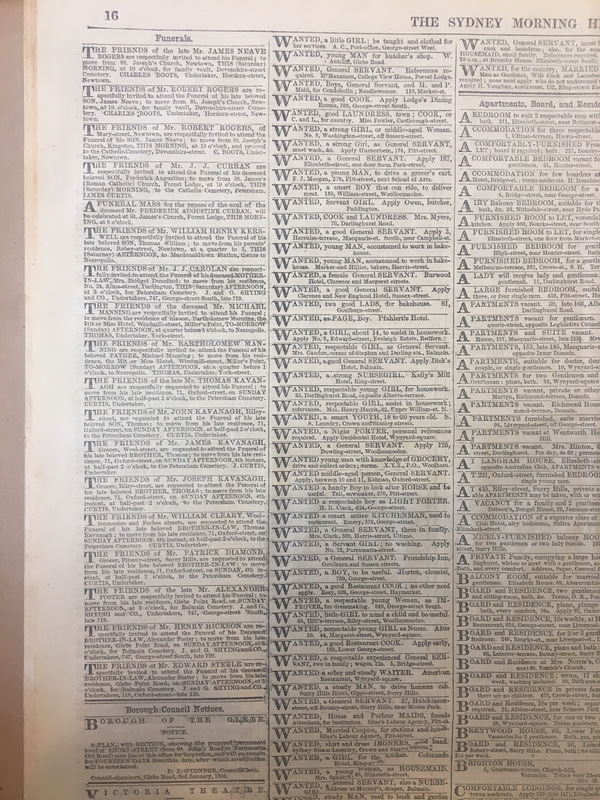 Problem: The issue available on Trove is missing a number of death notices from p2 cols 1 and 2, due to either a poor quality film being digitised, or a failure during the digitisation process. 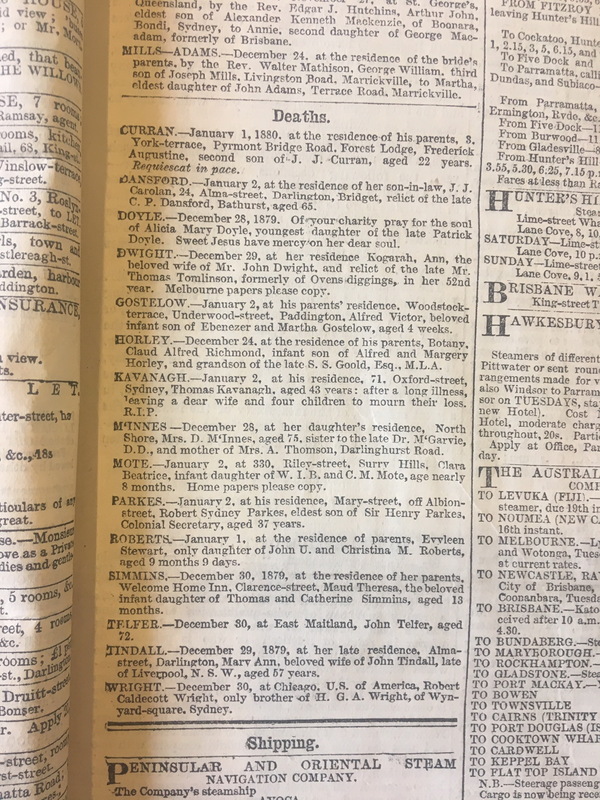 Problem: The issue available on Trove is missing a number of death notices from p2 col 1, due to a chunk of the page being removed. 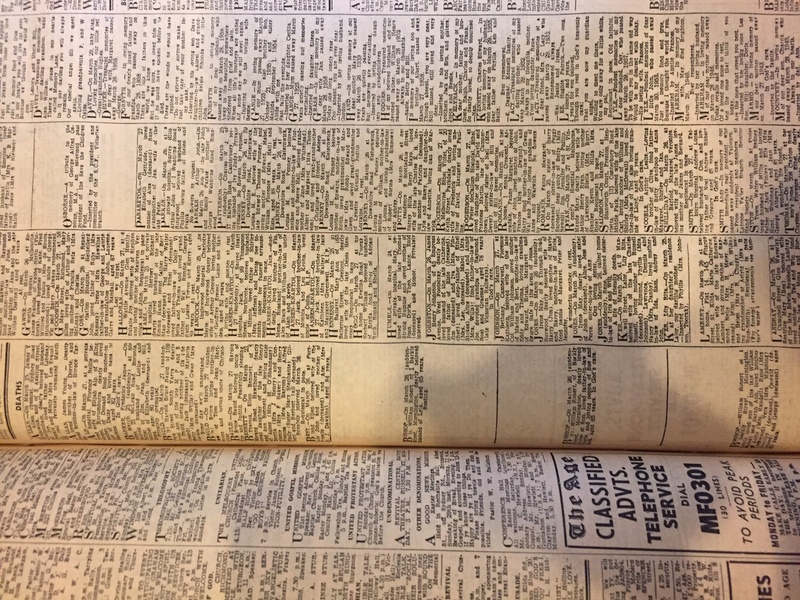 Problem: During the filming process, a piece of foreign material (paper or similar) has been placed over some of the notices on page 2, obliterating some notices. 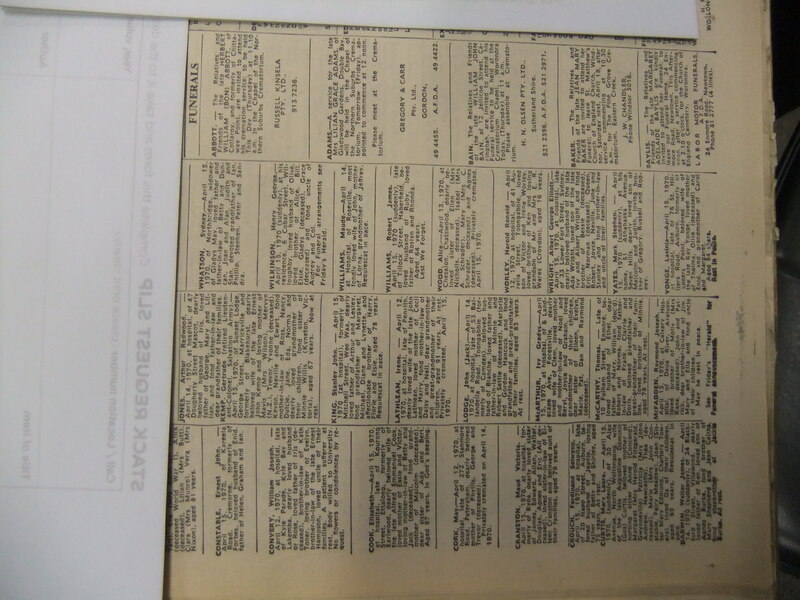 Problem: This edition of the SMH contained 22 pages, with the death and funeral notices appearing on p22. Unfortunately only pages 1-21 were filmed. 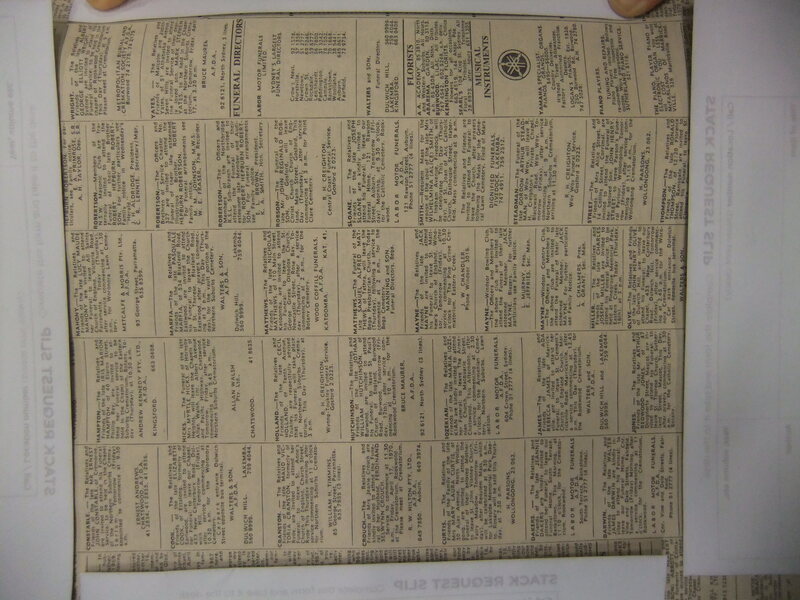 Problem: This edition of the SMH contained 120 pages, with the death and funeral notices appearing on p120. Unfortunately only pages 1-119 were filmed. 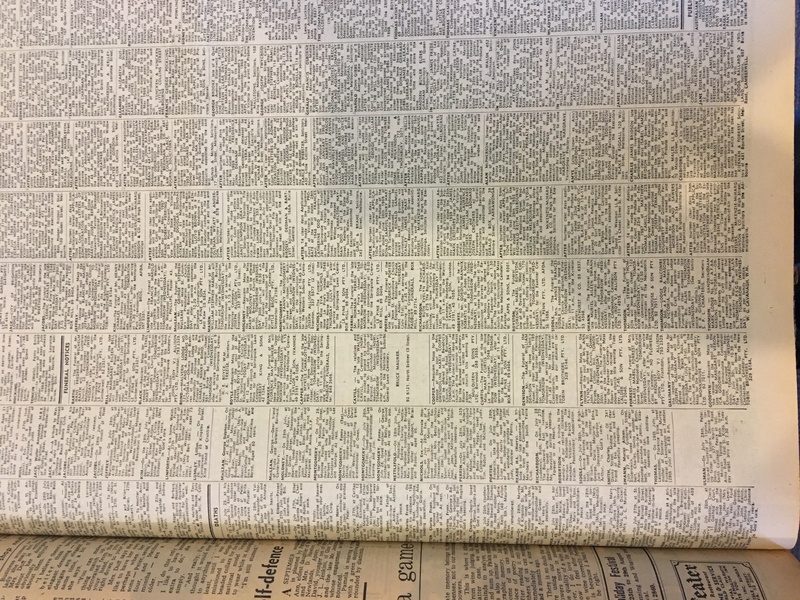 Problem: Pages 49-88 were omitted from the microfilm. 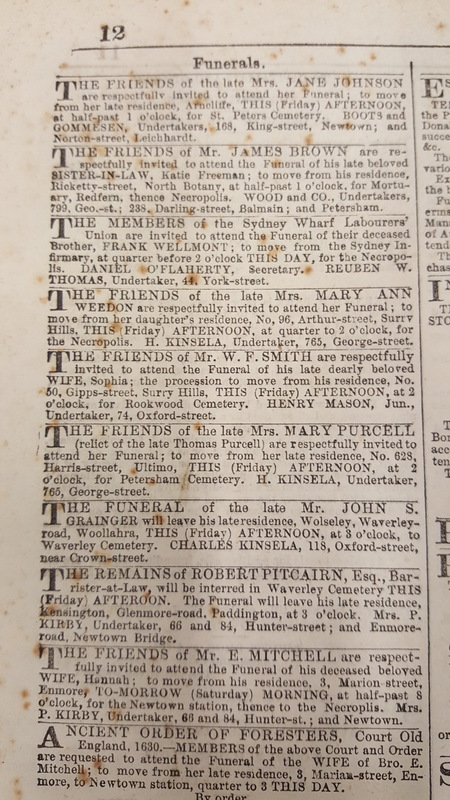 The death and funeral notices were published on p81. 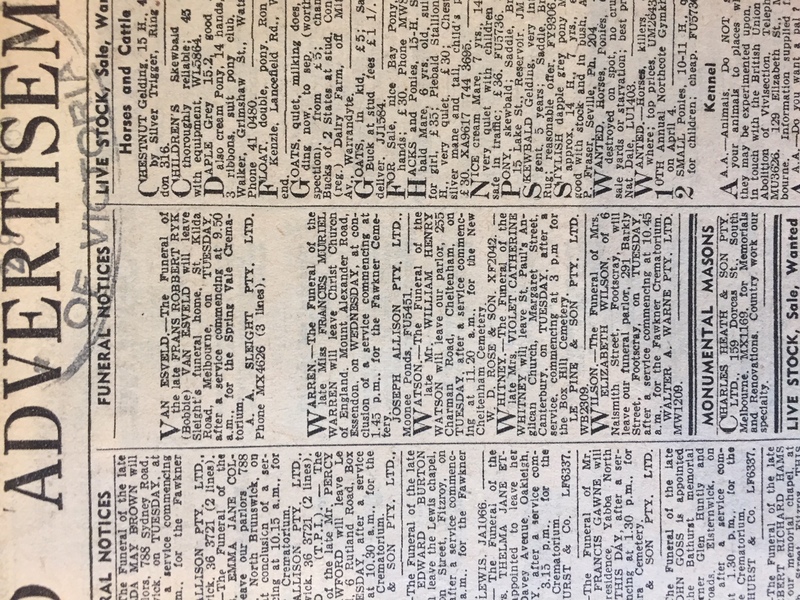 Fortunately, an index of names from the death and funeral notices was published on p2, and this has enabled us to confirm the hand-dated photocopy of the notices is definitely from the incorrectly-filmed issue. 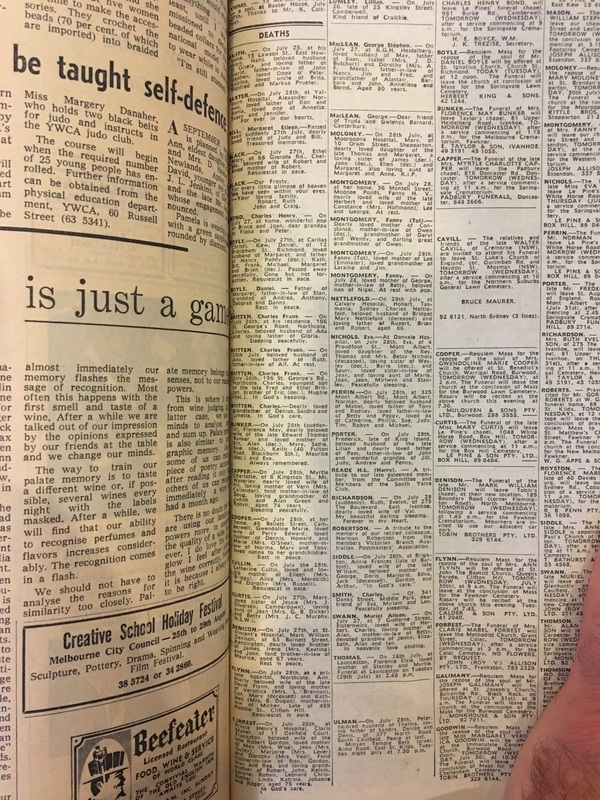 Problem: The Fairfax Digital Archive is missing this entire issue - the issue of 21 Feb has been incorrectly inserted in its place. This page is owned by Ryerson Index Inc, a non-profit organisation incorporated under the laws of New South Wales, Australia. The last update was March 25th, 2019.